Every farm has them…that signature farm storage building or two to store all the equipment that makes for a successful farm. Are your current equipment storage buildings on their last leg? You can’t afford to keep your brand new machinery in your old farm buildings, that allow every animal and insect inside. We realize your need for affordable farm storage, made with the highest quality of materials. Our designers can help you with a custom layout that fills your needs. Take a look at all the advantages of purchasing a brand new Hansen farm building. 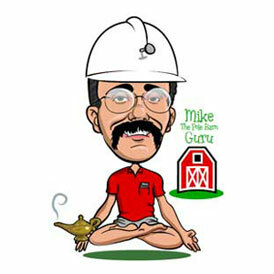 The first question you should ask yourself is what are my farm storage needs. 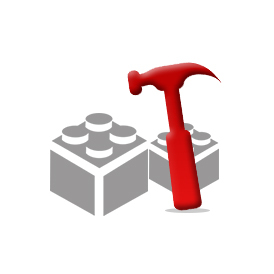 Figure out what size buildings will be needed to fit all machinery and still have some room to work. With the ability to clearspan farm storage buildings 100′ wide you have plenty of options to fit the largest equipment. Next ask yourself how tall of a building you will need. This will determine the necessary eave height required for your equipment storage building. For large steel farm buildings the rule of thumb here is going to be two feet taller than your largest door opening. Doors you ask? Lets discuss some of our shed kit options. Take a look at some previous customer – farm buildings. Visit the Farm Buildings Gallery Farm Storage Gallery. 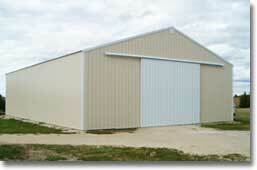 Hansen Buildings offers overhead and sliding doors up to 32′ wide and 16′ high. Our large selection of door models come in a variety of styles with insulated and non insulated versions available. Insulate all or portions of your building with commercial wall girt options which place your wall girts 24″ on center. With 2×6 wall framing standard on our shed kits, this will create a large area to properly insulate your building. 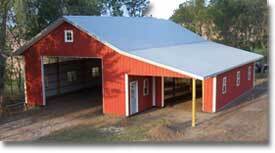 Hansen farm buildings also come standard with reflective roof insulation to reflect heat in the hot summer months. Dress up that farm storage barn with wainscot, cupolas, overhangs and more. Get a free quote on custom shed kits in minutes! Hansen farm storage buildings are built to last with its double truss design specifically engineered to meet your local building codes. All wall girts and purlins are a minimum #2 or better kiln dried 2×6 lumber. For building departments that require it, we include sealed engineered plans. Along with your engineer sealed plans you receive a limited lifetime warranty. The only known warranty of its kind in the industry. All building kits come complete with two sets of 24″ x 36″ plans with more sets available for purchase. Our high quality standard doesn’t stop there. All farm storage and equipment storage buildings come with specifically engineered powder coated screws and ledgerlocks for a strong truss to pole connection. All poles are treated with a minimum .60 cca treatment and wall girts are laid flat like shelves to take advantage of the strongest edge of the wood. Ready to start planning that dream farm building? 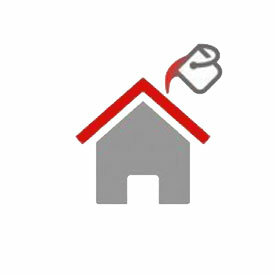 Get a free building quote in minutes! A building can be a tough decision. Call 866.200.9657 for a free consultation now! Know more about our pricing.. The industry’s most comprehensive post frame blog. 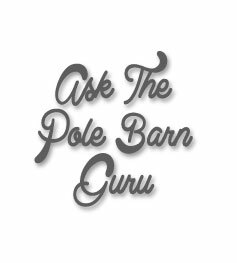 This guru will grant you the answer to one pole barn question! 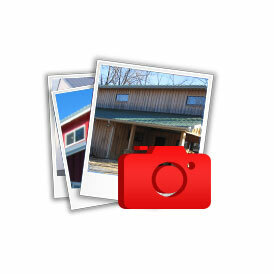 Look at our collection of building photos for creative ideas! Lets pick out some colors! Founded by J.A.Hansen, Hansen Pole Buildings, LLC, was formed as a limited liability corporation in 2002, as an internet-based business providing custom designed, high quality pole building kits at affordable prices. The Hansen Buildings vision is to be the industry leader in post frame building kits as solutions to personal living, storage and agricultural needs while making great service a priority.